Recently, we blogged about murders in 2018 and compared them to 2017. 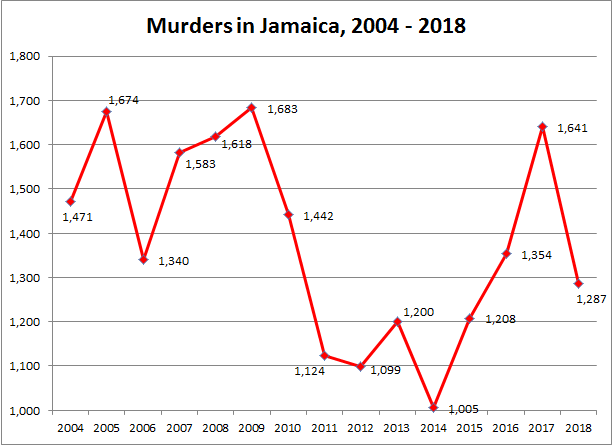 This post takes a look at the recent history of murders, as far back as our data would allow, which is 2004 for Jamaica as a whole and 2012 for breakdown by parish. This blog post gives some unverified data about murders going back as far as 1970. Although any unnecessary loss of life is sad, in the context of today’s violence it would be a dream to go back to 152 murders in a year as the blog suggests that 1970 saw. Jamaica has seen, officially, 20,729 persons murdered in the period 2004 to 2018, an average of 1,382 persons per year or just under 4 per day for 15 years – someone is murdered every 6.3 hours in Jamaica, for the last 15 years! For those with statistical minds, the median was very similar at 1,354 persons. Thankfully, 2018 saw Jamaica fall below both our mean and median and 2019 will hopefully continue this trend. We’ve seen peaks in 2005 (1,674), 2007 (1,583), 2008 (1,618), 2009 (1,683) and 2017 (1,641). While we have also seen three “low” periods in 2011 (1,124), 2012 (1,099) and 2014 (1,005). What is more troubling is the explosive rise in murders in normally quiet parishes. Kingston, St. Andrew and St. Catherine have always been troubled parishes, but the meteoric rise in St. James was very disturbing and subsequently arrested by multiple Zones of Special Operations and States of Emergencies. 1. Clarendon also saw murders more than double from 2012 to 2017 before falling in 2018, but still more than 58% above 2012 levels. 2. Westmoreland, better known for sun, sand and relaxation moved from 68 murders in 2012 to 141 murders in 2018, an increase of 107%! 10. 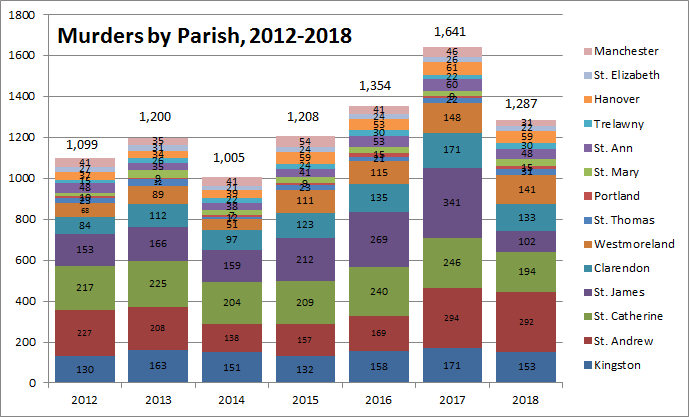 The only parish that was unchanged from 2012 was St. Ann with exactly 48 murders in both 2012 and 2018.
diG4U: Check out our Timelines!